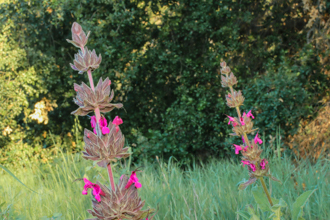 We are fortunate to have several species of Sage in our local mountains: White Sage, Purple Sage, Black Sage, Chia and Hummingbird Sage. 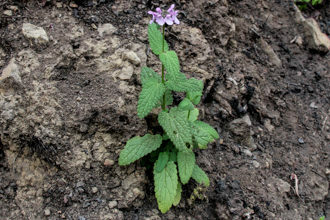 These plants belong to the Mint family and had many uses for the native peoples of California. 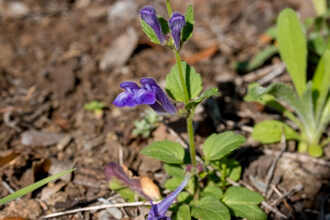 A common trait to most Salvias is that they have opposite leaves and round stems that start out square. The flower is a colorful corolla with two lips of unequal length. 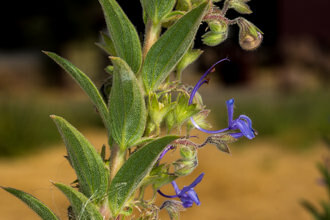 The calyx is often two-lipped - for Purple Sage we have a one lipped calyx (there is no lower lip). The upper lip has three teeth. Colored filaments and two Stamens protrude from the flowers. 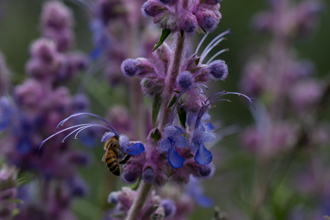 A frequent companion of Purple Sage is Sagebrush. The more well-known Sagebrush (Artemisia californica) is not related to this group of plants - it is surprisingly a member of the Aster family. What Sagebrush and the Sages have in common is pleasant fragrance produced by the plants. 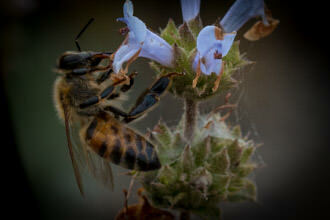 Purple Sage -Salvia leucophylla - is an evergreen shrub that grows up to five feet tall and nearly as wide as it is tall. Leaves are a light green in the spring, turning grayish-white as they mature. The leaves can also be described as crenulated (a more precise word for scalloped), fuzzy on the bottom side and are soft like felt. Many branches arch out from the center towards the sky as they reach for the sunlight. 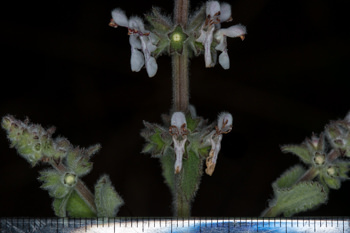 The flowers grow in compact whorls on 15 to 20 cm (6 to 8 inches) long inflorescences. If you look at the plant stalks where the flowers are blooming you can observe the stalk transition from wooden twigs to a sort of herbaceous pink gray shaded stalk. 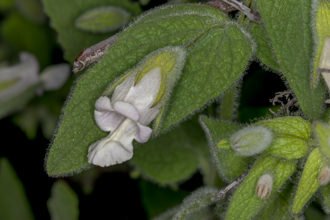 The 2.5 cm (1 inch) flowers are pinkish-purple, surrounded in a calyx that is some color between purple and gray. The first time I photographed this plant in bloom I was so delighted because the flowers looked like a beautiful fancy dessert - I now realize these are much more beautiful than a dessert. When in bloom, Purple Sage is a crowd pleaser - what is not to like about abundant Purple flowers against a drab background of the supporting plant? 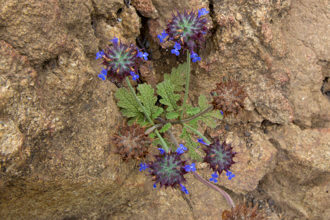 Favored Habitat: The plant is typically found on dry hillsides and in gravelly soils - which there are plenty of in our local mountains. 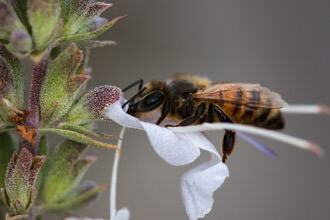 There are several scholarly papers available on the Internet that describe how Purple Sage uses chemical in the oils contained in the leaves to discourage all manner of plant life around it. There is a lot going in the plant community that we remain blissfully unaware of! Last modified: March 31 2017 21:25:21.